When the NHL season ends for players, either because of missing the playoffs or from an abrupt exit from them, many turn their attention to the IIHF World Championships. Of course, most would prefer to be battling for the Stanley Cup, but playing in the World Championships provides not only solid experience for a possible Olympic roster spot, but also a great consolation prize to those that win the tournament. The tournament will be split between two locations this year: Helsinski, Finland and Stockholm, Sweden. The United States will begin the tournament on Friday, May 4th against France. In the past, the American team has not had much success at this event, only medaling twice in the past twenty years (both bronze in 1996 and 2004). The United States hasn’t won gold at the event since way back in 1933. While, on paper, this team doesn’t appear to have a shot at the gold, it does look like they have a legitimate chance at competing for a medal spot. Team USA’s forward group possesses a bit of star power this year. The group will be led (and largely dependent) on the play of Bobby Ryan. The Anaheim Ducks left winger already has major international experience from playing with Team USA at the 2010 Olympics and needs to be the foundation of this team’s offense if they are going to succeed in this tournament. Everyone knows what Ryan is capable of, but the trick will be getting hot quickly in this short tournament. In addition to Ryan, the U.S. will also be dependent on forwards Max Pacioretty, Kyle Okposo, and Paul Stastny to carry the bulk of the offense. While Stastny and Okposo are coming off solid NHL seasons of 53 and 45 points, respectively, Pacioretty is the most likely candidate to be this team’s offensive catalyst. Pacioretty just had a breakout season in which he scored 33 goals and 32 assists (both career highs). If Pacioretty can carry his NHL success over to this tournament, it would take some of the burden off Ryan and make this team that much more of a threat. The rest of the USA forward group is less talented, filled out with solid NHL players like Justin Abdelkader, Nate Thompson and younger players like Cam Atkinson and Kyle Palmieri. While this group of forwards isn’t the biggest, they’ll likely make up for this with their speed. If any of these forwards can provide secondary scoring, Team USA will be a team that no one wants to face come the elimination rounds. On the backend, the U.S. team will be anchored by 2010 Olympian and World Championship veteran Jack Johnson. After being traded to the Columbus Blue Jackets and having to watch his former team, the Los Angeles Kings, make a surprise run in the NHL playoffs, expect Johnson to be playing with a chip on his shoulder. There’s no doubt that he is the most talented defenseman on this roster and will probably see a ton of ice time during this tournament. A possible breakout star among the defenseman may be Carolina Hurricanes’ blueliner, Justin Faulk. Faulk had an impressive rookie campaign in which he notched 8 goals and 22 points. His booming slapshot could be a key to the U.S. power play, especially if he is paired up with the smooth skating Johnson. 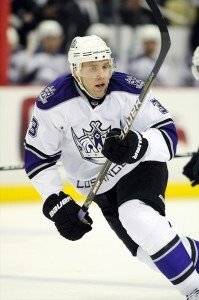 In addition, to Johnson and Faulk, the U.S. defense will boast solid players in Cam Fowler and Alex Goligoski. However, the final pair is more of a question mark, with Chris Butler and Jeff Petry the likely duo and Justin Braun sliding into the role of seventh defenseman. For the first time in a while, Team USA will have a legitimate number one goaltender between the pipes. 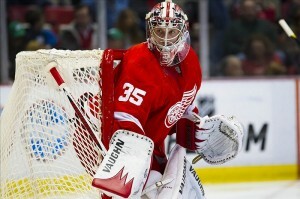 Due to the Detroit Red Wings early first round exit from the playoffs, Jimmy Howard was able to join Team USA. While the Americans will certainly need solid play from their forwards and defenseman, the team’s success will likely come down to the play of Howard. Howard should be motivated to perform well during the tournament not only because of the Red Wings’ early exit, but also because this could be a tryout for the 2014 Olympic squad. It seems certain that Jonathan Quick and Ryan Miller will be on the team, so that leaves one spot open. With a solid showing at the World Championships, Howard could pencil himself into that spot. In addition to Howard, the U.S. also has Dallas Stars’ Richard Bachman and former NHLer John Curry on the roster. While Bachman may see the odd game, expect to see Howard between the pipes as long as he plays well. While this U.S. team appears to be stronger than in year’s past, Canada, Sweden, and Russia all will stand in the way of the Americans’ medal hopes. With that said, there’s something to like about this year’s squad, which possesses a solid mix of stars, role players, and a legitimate number one goaltender. If the team can gel quickly and Howard can get hot, they can make some noise this year. Expect them to upset one of the big three and take the bronze medal.